South Carolina waterman, Fred Dockery, hauling crab traps on Stono River in SC. Last week, I made my first visit to Charleston, South Carolina for a national meeting of fisheries scientists. Before settling into the meeting room for three long days, I spent a day on the water with Fred Dockery, a local commercial fisherman, to learn more about his work. Fred and I first got in touch more than a year ago and began a correspondence based on our shared interest in oyster toadfish, a species once described in a scientific paper as “grotesque” and one that only a fisherman or ichthyologist can truly love! Although many people look down upon them, toadfish have made important contributions to neurological research, boost production of natural and cultured shellfish by controlling predators of young clams, oysters, scallops and mussels, and support small commercial fisheries in Delaware Bay and Long Island. Toadfish were not, however, the order of the day. 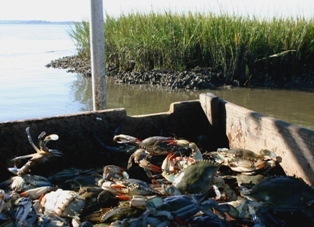 Instead, our quarry was the famous blue crab, an icon of the Chesapeake Bay but also plentiful in South Carolina waters. 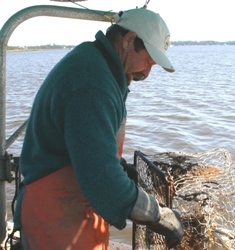 Fred primarily fishes for blue crab, but like many small-scale coastal fishermen he earns his living harvesting a variety of local resources, including shrimp, clams and oysters. We also encountered stone crabs in his traps and did so carefully, for their tasty claws are much more powerful than those of a blue crab and can do much more damage. Stone crabs and blue crabs from the South Carolina Stono River. I was not the first guest Fred had welcomed aboard his boat. Writers from the Food & Wine blog and Hugging the Coast magazine had previously fished with Fred and written about the experience, tying his livelihood with the splendid cuisine of the Carolina lowcountry. In fact, I wasn’t even the first scientist to accompany Fred who has participated in collaborative research with state and federal biologists, and even co-authored a scientific report on a study of dolphin entanglements that he helped conduct. Fred and I launched his 19-foot boat near the eastern mouth of the Stono River from James Island. The Stono has no purely freshwater stretch along its length, and instead is primarily flooded and drained by tides rising and falling from the Atlantic. 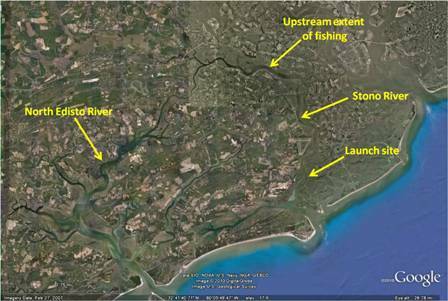 At its most upstream reaches, the Stono connects with the North Edisto River and together they form the semicircular backbone of a productive system of tidal creeks and marshes. Aerial view of the Stono River in South Carolina. Hailing from the Northeast, where natural oyster beds and reefs have all but vanished from most coastal waters, I was particularly struck by the abundance of oysters. I noticed how, in many places along the Stono, oysters grow right along the marsh edge, helping to trap and stabilize sediments and buffer the marsh from erosion due to storms and boat wake. The importance of these types of habitat mosaics is a poorly understood and even more poorly appreciated aspect of coastal ecosystems, although a developing restoration plan for the Hudson-Raritan estuary in New York and New Jersey notably includes habitat mosaics as a key goal. Fred and I worked our way north on the Stono for nearly 10 miles, pulling and resetting traps, and sorting the catch. I saw first-hand the upstream shift from female- to male-dominated catch, and felt the sharp sting resulting from the inescapable reality that blue crabs are much faster than I am, even out of the water and on my turf. Fred, on the other hand, long ago perfected moves that allow him to avoid the steady grunts of “ouch!” coming from my end of the culling board. Still, as the day wore on, practice and trust in my heavy rubber gloves made me bolder with the crabs and quicker with the cull. 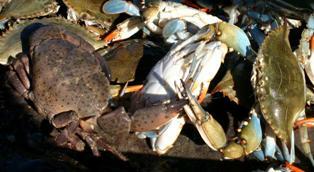 Blue crabs by the marsh on the Stono River in SC. Our fishing day ended in time for Fred to head downtown for a meeting. Fred is a fisherman who takes very seriously his responsibilities off the water. He serves on the Board of Directors of the South Carolina Seafood Alliance, and is an active advocate for limited entry in the South Carolina blue crab fishery. The primary goal of limited entry is trap reduction in order to ensure that fishing effort is commensurate with resource productivity. Reducing effort as permits expire and are not renewed will eliminate opportunistic and out-of-state fishermen, and in doing so secure fishing businesses for those who are truly invested (financially and through their identity) in the fishery on a regular basis and for the long-haul. The timing of my trip with Fred could not have been better, given that my next few days were spent buried in the intricacies of fisheries science. Our excursion provided a renewed awareness of the importance of scientists keeping close to the water through field research, time on commercial fishing boats, or simply sport fishing in their spare time in order to keep the math and models in our heads balanced alongside real-world perspective. I was also reminded of the importance of regular dialogue and cooperation between scientists and fishermen so that each can understand and incorporate the other’s perspectives and ideas in meeting shared goals of productive and sustainable fisheries.